I know I usually do my printables on Tuesdays, but it's spring break this week for my boys, and we're leaving town today. We're headed up to grandpa and grandma's house for the week. My sisters are coming too, and that means lots of fun, and lots of cooking. I'm hoping to be able to post a bunch of recipes during the rest of the week, but we'll see how things go. So, here's your Tuesday printable on Monday. 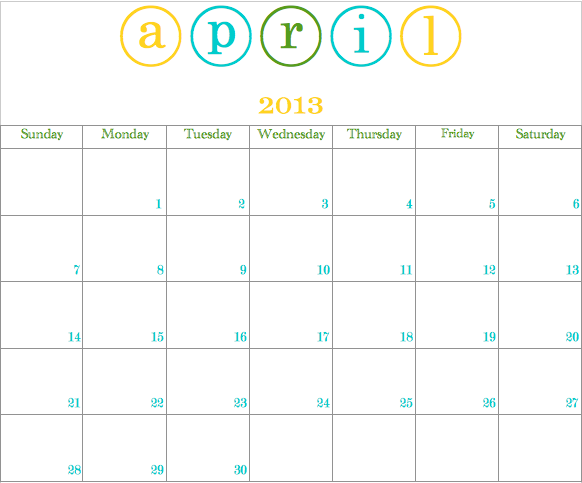 It actually worked out well because my printable is an April calendar, and today's the first day of April. I'm always looking for cute calendars to use, but sometimes I can't find quite what I'm looking for. It's fun to be able to make your own. You can click here to print your April calendar. P.S. Happy birthday day to my wonderful sister-in-law/friend, Tiffany! I'm sure lucky that way, all my sisters-in-law (and sisters) are my best friends. Very Cute! I’d love for you to check out our 2nd Pattern Party! Those with free patterns and templates to share are invited to link up! Thanks so much for visiting and for the invite, Chelsea! I'll be over. Have a great day, and come again soon! Hi, Wenddie! I'm so sorry the printable didn't work for you. Maybe trying clicking on the printer icon just to the left of the calendar image to print. Let me know if that helps. Thanks for visiting! Your are so welcome, Scott. I'll have another one in May (which is only a week away, time flies!). Have a great day! Over the years I've ordered dozens of calendars that were printed with less than expected quality. Last year my company printed some calendars with PCA Delta in Pompano Beach FL, and they were great. I've been printing with them ever since. If you need calendars printed go to http://www.pcadeltaprinting.com/ I strongly recommend them.